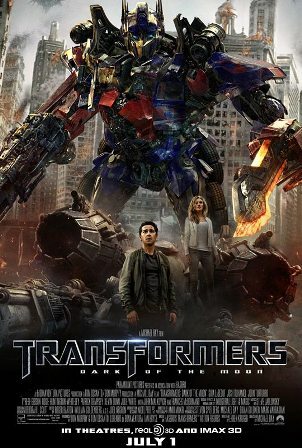 Summary: Transformers: Dark of the Moon (2011) has many new Transformers and amazing action, but suffers from a lack of chemistry between Shia LeBouf and Rosie Huntington-Whiteley. In the beginning of the film, a ship from Cybertron (the home planet of the robots) crash-lands on the moon during the 1950s. The Autobots learn about America's plan to hide the crash site and race against the Decepticons to recover a secret weapon. There, they reactivate the scientist Sentinel Prime to uncover its secrets to battle the fallen Megatron. When we catch up with Sam Witwicky (Shia LaBeouf), he's living with his new girlfriend and lamenting about his unemployment. Apparently, even though the Transformers are household names, the government says he can't tell anyone. No one explains why. The real explanation is they wanted his character to be a loser driving a beat-up Datsun with an incredibly hot girlfriend (Rosie Huntington-Whiteley). That's what they call drama, I guess. But at least Shia LeBouf has more to do in this film than the last one, dealing with insecurities and jealousy over her girlfriend's boss Dylan (Patrick Dempsey). Speaking about Rosie, her first scene is a pan up her legs in her underwear. That's her best acting in the film. While she isn't horrid, the Victoria Secret model makes Megan Fox look like a Shakespearean. Plus, the two have no chemistry. Shia and Megan had real chemistry on and off the set, and it showed. These two look almost bored with each other. Director Michael Bay made an insanely hyped-up version of his original film. He takes the battles between the Decepticons and Autobots to incredible heights including a dizzying battle in a falling skyscraper. He even revisits the battle on the freeway from the first film with more robots and mayhem. A couple of hilarious cameos by John Malkovich as boss Bruce Brazzos, and Ken Jeong as a paranoid conspiracy theorist provide some unexpected laughs. Leonard Nimoy does an incredible job voicing the former leader of the Autobots, Sentinel Prime. All the acting is good, simply because the characters have something to say besides running away from rampaging robots. Overall, Transformers: Dark of the Moon is better than the second film, but not as good as the first film. By the way, there's nothing after the credits. Don't bother waiting. Are you planning to watch Transformers? Have you seen it? What did you think? Sentinel Prime yes. Without giving away too much he stole the whole movie. Leonard Nimoy is amazing. Transformers3. has over 40,000,000 views on youtube. When I watched the astronauts trekking through the spaceship wreckage, a huge smile spread across my face when I saw Sentinel Prime. Yep Alex. It might win an Oscar for special effects. If Norbit could get nominated anything is possible. I saw it and agree - better than the second, not as good as the first. But awesome special effects!